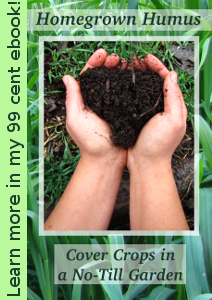 While hanging out with other farmer geeks last week, I discovered that there is a cool new cover crop making the rounds --- radishes. Everyone's glowing about the way tillage radishes, oilseed radishes, groundhog radishes, fodder radishes, forage radishes, and daikon radishes mellow clay soil, adding copious amounts of organic matter and tilling through hardpan. If you play your cards right, you can even graze your livestock on the radishes a time or two during the fall since most of the cover crop biomass comes from the roots. What really caught my interest, though, is news that these cover crop radishes winter-kill here in zone 6, meaning that they work perfectly with no-till systems. I clearly had to give a radish cover crop a try, but which one to choose? A little research made the choice simpler since all of the names I listed in the last paragraph refer to the same species (Raphanus sativus.) Now, to be fair, cabbage, broccoli, and collards are all members of Brassica oleracea, so it's clearly possible to come up with multiple subspecies that act quite differently. 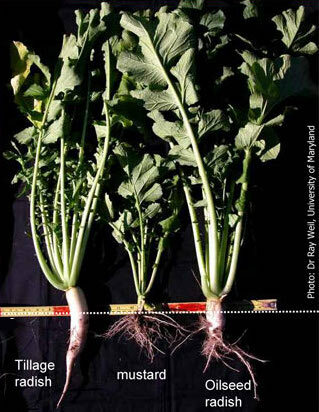 But in the world of cover crop radishes, there is really only one huge distinction --- the daikon radish has been bred to be eaten while all of the others have been bred primarily for biomass and are types of oilseed radishes. Groundhog radish and tillage radish, specifically, are terms that plant breeders have trademarked for their line of oilseed radishes. The differences between the varieties seem to come down to the roots. Many people want a long, thin taproot like that found in the tillage radish, but we don't have hardpan, just heavy clay, so I chose to go for a more branched root instead. That said, cover crop radishes are so trendy that the ones I wanted the most were sold out and I had to settle for a generic oilseed radish from Johnny's Select Seeds. Before you go out and seed your front lawn with radishes, though, I should warn you of one factoid I noticed on every website. When oilseed radishes freeze and rot over the winter, the resulting smell is quite foul. Maybe it's best not to plant them beside your front door. Too busy to garden? Microbusiness Independence shows you how to find time for the things that really matter. What about the small red/purple radishes? They're very nice raw and in salads. I knew someone was going to ask that, but I was betting on my father. 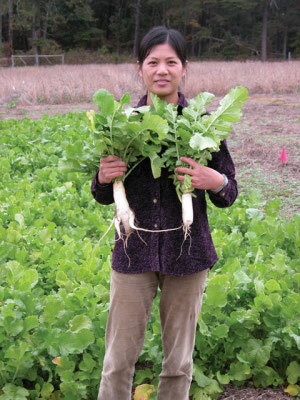 Those radishes produce much less biomass --- they've been bred to be small and tender. But they are in the same species.